Some how it is June! Time and money seem to zoom through my life So do smiles and memories of fantastic friends. I keep making more money and more friends... it is just that time thing that I do not have under control! Now that it is June, the temperature is rising, yet there still can be a cool morning out there. And it might just be a cool morning when some good oatmeal is on the top of the want list. If that is the case, try some Oatmeal Buttermilk Pancakes. These wonderful wake up morsels can be enhanced with fruits and different nuts too. Does life get better? Combine rolled oats, and buttermilk; mix and let stand 5 minutes. Combine dry ingredients. Add eggs and oil to oats and buttermilk, combine. 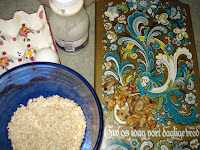 Add dry ingredients to oat mixture along with the nuts. Stir until smooth. For each pancake pour a bout 1/4 c batter onto hot lightly greased griddle. Brown on underside; turn and brown second side. Serve with butter and maple syrup. If fresh strawberries are in season, slice them along with blueberry and pile on top. Oatmeal is healthy, fruits are wonderful and nuts add the crunch that jump start a morning! Hope you have a wonderful day! I requested these for my Father's Day breakfast! Due to my diabetes and to avoid a lot of sugar (syrup) I placed some butter on the pancakes and then spread brown splenda on top with wild black raspberries! They were absolutely delicious! Recipe sounds terrific!! In the photo, there is an egg tray, I wonder where I could find one like it. Sarah, I bought the ceramic egg tray in Charleston, SC. It is just like one I bought for my Mom while visiting the Azores: Lajes Air Base.. back when it was open. That pattern like the islands, is Portuguese. The shop is next to the open market down town Charleston. It is jam pack full of pottery that is beautiful!